Park homes is the generic term used for the prefabricated modular units from Kwikspace. 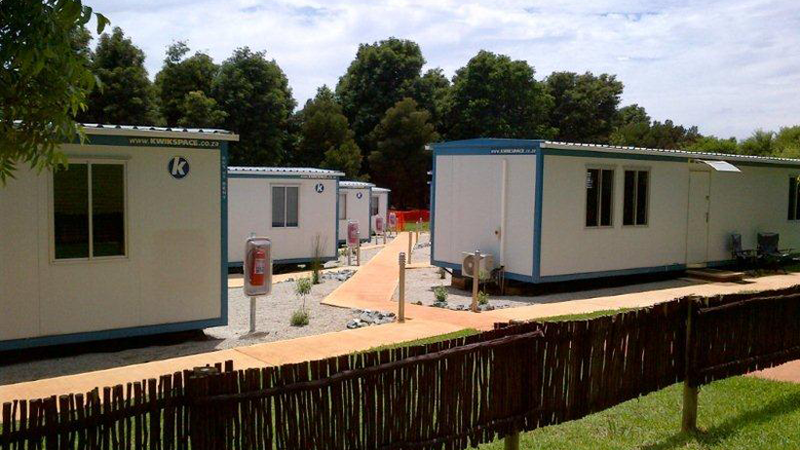 Park homes consist of modular, mobile prefab structures that are ideal for permanent and temporary buildings like site offices, ablutions, clinics/hospitals, classrooms, kitchens and diners – and in almost any configuration for industrial, residential and commercial purposes. 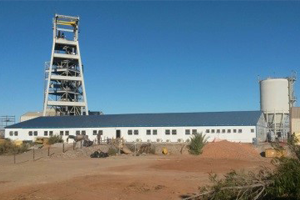 Park homes from Kwikspace are prefabricated spaces for any requirement and used extensively in mining and construction. 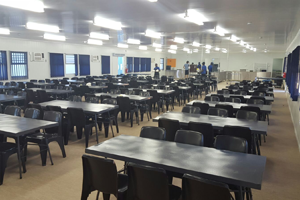 Government and the private sector use Kwikspace for temporary or permanent classrooms and schools. The police and military make use of them for dormitories and kitchens to office space and storage units, and they are used for event registration offices, media rooms and more. They make ideal homes as additions to free-standing structures or developing neighbourhoods. 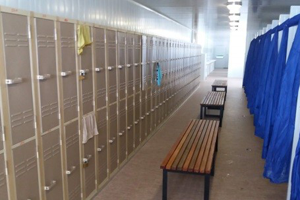 Cost-effective and suitable for any kind of office, house, ablution, storage facility, classroom, etc. Manufactured according to ISO 9001:2008– and OSHAS 18001:2007, with a minimum rated lifespan of 20 years. 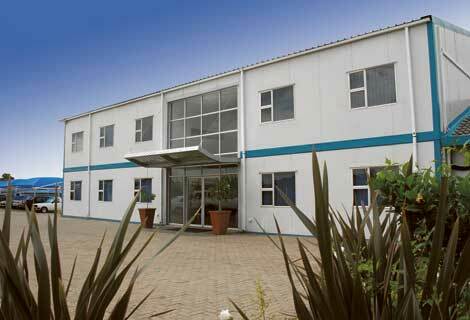 Kwikspace is Africa’s largest manufacturer of prefabricated buildings. They are a cost-effective way to rapidly meet your needs to supply space: for homes, schools, clinics and site offices in the mining, construction, government and humanitarian sectors. 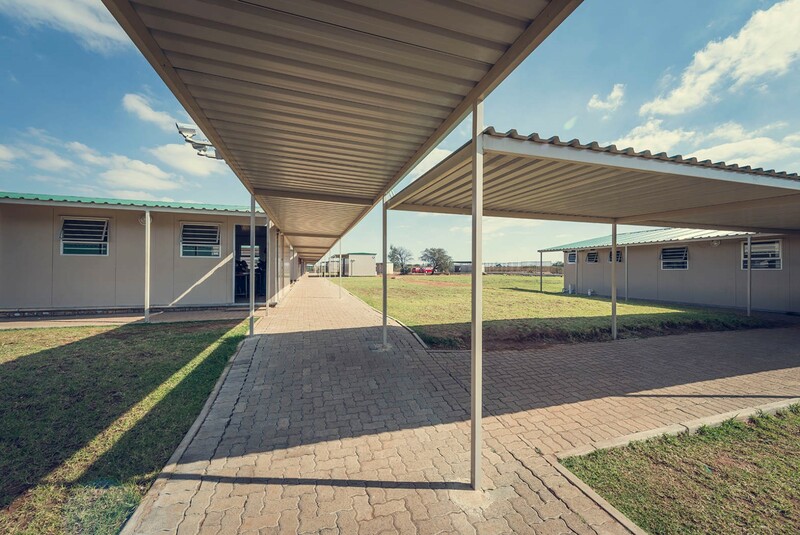 As a park home supplier, we offer multiple layouts like single or shared accommodation, residential houses and dormitory style facilities are offered with these mobile buildings, all of them as comfortable as traditional buildings. 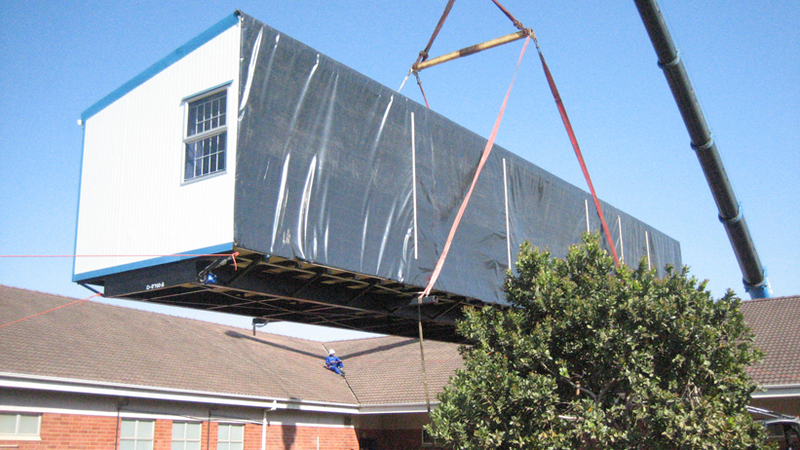 Prefabricated homes can be delivered on the back of a truck! Speak to Kwikspace about your park home requirements. Our prefabricated park home come in lengths of 6, 9, 12, 15 and 18 m, and widths of 3 or 3.5 m.
Double-wide prefabricated park homes are the result of joining 2 single-wide units to acquire a 7 m-wide unit. 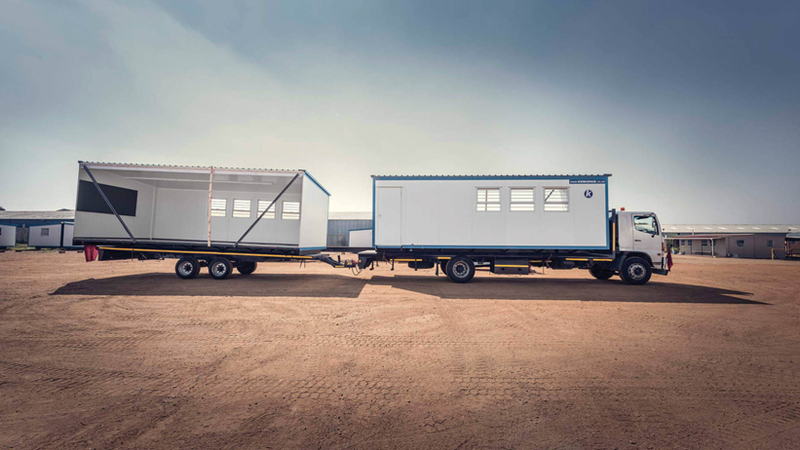 They are available in lengths of 6, 9, 12, 15 and 18 m.
Buildings are prefabricated in modules giving Kwikspace the flexibility to supply a wide range of building sizes for all building types. Prefab buildings from Kwikspace cater for all building types across all industries, to your exact specifications. 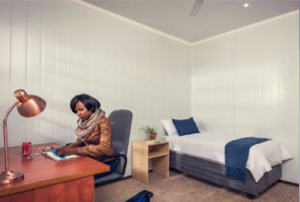 Temporary and permanent prefabricated accommodation, Kwikspace offers multiple layouts like single or shared accommodation, residential houses and dormitory style facilities are offered with these mobile buildings, all of them as comfortable as traditional buildings. 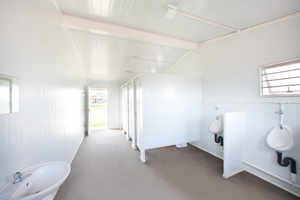 From temporary facilities during green or brown field projects to permanent facilities. 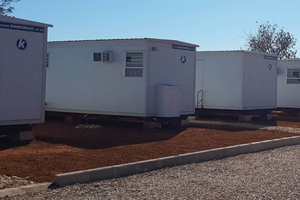 Kwikspace has constructed 10 man to 800 man camps in remote locations and has completed over 300 projects throughout Africa. 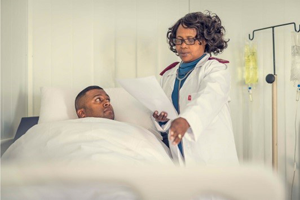 From hospitals and medical centres that require treatment space to rural clinics that aren’t easily accessible by road. Kwikspace has built more than 30 complete schools. Being fully relocatable they can be easily re-deployed on other sites. Connected into a sewer system or a conservancy tank, they offer a more pleasant and cost effective solution than chemical toilets. Toilets, showers, change rooms can all be configured. These buildings are supplied with all the bathroom fittings and geysers and require an easy connection to existing utilities. 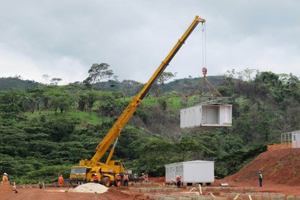 Safety in our prefabricated structures are top of mind. 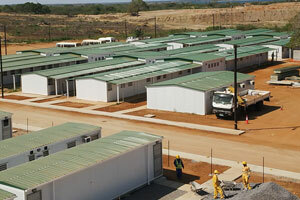 Kwikspace has the largest modular building rental fleet in sub-Saharan Africa. 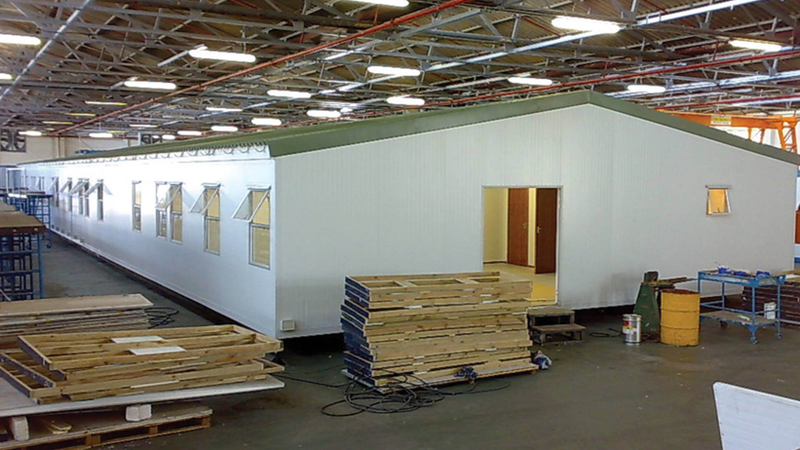 We manufacture permanent modular buildings daily in our ISO 9001:2008 factory! We can deliver rented accommodation in 10 working days or less. Accommodation for purchase take only a little longer – delivered to site in up to 4 weeks. Desks, chairs, bedding, other furniture and furnishings included on request. Kwik and easy modular building space with rental options. What makes Kwikspace’s park homes superior? 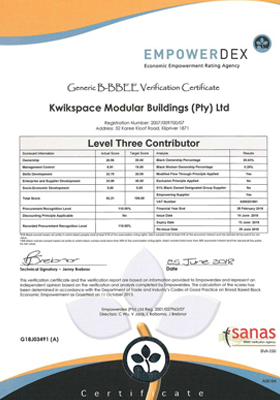 Our current B-BBEE scorecard is level 3. Kwikspace has a good Broad-Based Black Economic Empowerment rating and uplifts skills in South Africa. We strive to make a positive contribution towards the South African economy. 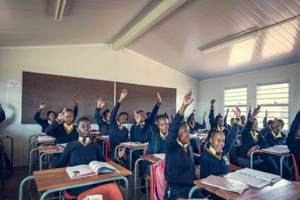 Opportunities and practices are implemented to ensure that there is equitable representation and participation for all population groups in the economic activity of South Africa. 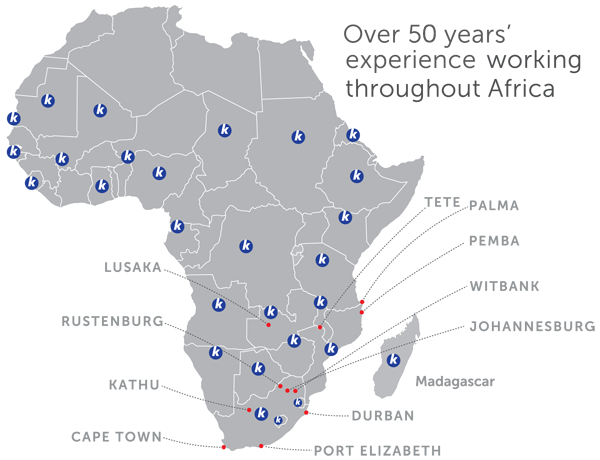 With 6 branches strategically located across South Africa, we are able to reach your site quickly and efficiently, no matter where. We have significant capacity with our own panel manufacturing plant, where we carry out stringent processes to ensure the highest quality fit for onsite and mobile units. Click here to find your nearest Kwikspace branch. 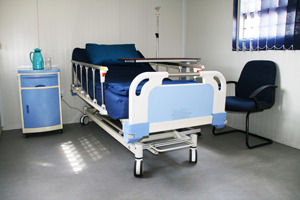 Modular buildings for any space om demand requirement.